Each chapter is anchored in an interesting and meaningful challenge. Students use their new physics knowledge to creatively solve their Chapter Challenges. Students develop important 21st century skills as they work collaboratively in groups and engage in science discourse. Students engage in the Engineering Design Cycle as they iteratively work towards completing the Chapter Challenge. The program is based on cognitive science research encapsulated in the 7E Instructional Model. Student Edition and a comprehensive Teacher’s Edition are available in print and digital formats. Active Physics Plus extends learning for students who need and want more mathematics, depth, concepts, or explorations. 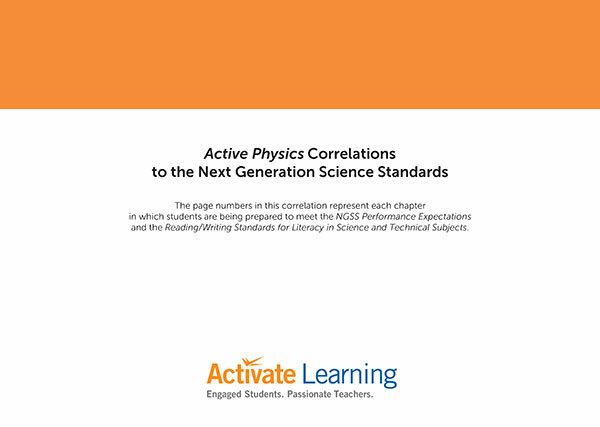 Active Physics Learning Community provides teachers with resources to prepare lessons as well as share and compare with other teachers in an online community. Online resources include daily lesson plans, pre-quizzes, student misconceptions, differentiation strategies, as well as videos that highlight the crucial physics for each section and videos that familiarize teachers with lab equipment and setup. Active Physics® is based on the research on how students learn—encapsulated in the 7E Instructional Model (elicit, engage, explore, explain, elaborate, extend, evaluate). As a result, Active Physics provides ALL students with a deep and memorable learning experience. Active Physics students are motivated to learn. Students are motivated to learn science in the context of highly engaging and authentic “real-world” projects that guide instruction and serve to organize their learning. Research shows that the project-based approach promotes excitement and meaningful learning for ALL students. Active Physics students learn like scientists. The science and engineering practices, as described in A Framework for K-12 Science Education, are integrated throughout the curriculum. Students engage with complex situations and collaborate on what they need to learn in order to manage the situation effectively. Active Physics is for ALL students. The Active Physics Plus feature in the student edition allows teachers to customize the program for students who want or need more mathematics, depth, concepts, or explorations. A comprehensive Teacher’s Edition and Resources provide full support for differentiated instruction with augmentations, accommodations, and suggestions for the English Language Learner. Chapter Challenge: Students demonstrate their knowledge of the physics of driving by making a presentation to a board of driving instructors. Through a series of activities, students learn about average and instantaneous speed and then connect information about reaction time, speed, and velocity to tailgating. They explore acceleration, positive and negative, in the context of the time required to bring a vehicle to a stop and decision-making at a yellow light. They also learn about centripetal force and acceleration and relate it to driving on curves. Chapter Challenge: Students develop a 2–3 minute voice-over for a sports clip explaining the physics involved in the sport. Students measure motion and learn about speed and acceleration. Through explorations, they learn about force and “discover” Newton’s three laws of motion and how they relate to sports. They also investigate acceleration due to gravity as well as physical and mathematical models of projectile motion. They explore friction, calculate the coefficient of friction, and consider the effect of friction in sports. Then they learn about gravitational potential energy, kinetic energy, spring potential energy, the law of conservation of energy, and how energy and work are related. Chapter Challenge: Students design a safety system to protect passengers during a collision. Students use Newton’s first law to describe what happens during a collision and apply the concept of pressure to the design of a seatbelt. They observe the effect of spreading a force over a greater distance and explain their observations using the work-energy theorem. After exploring the effects of a rear-end collision, they use Newton’s laws to describe how whiplash occurs. Students investigate the law of conservation of momentum by analyzing collisions. They measure velocity and force on a vehicle during impact and describe the relationship between impulse and momentum. Chapter Challenge: Students modify the design of a roller coaster to meet the needs of a specific group of riders. Students use gravitational and potential energy to explain their observations of a ball rolling down an incline and a swinging pendulum. They investigate spring potential energy and explore the law of conservation of energy. They determine the relationship between gravitational force and distance. Students learn about the difference between mass and weight, and determine Hooke’s law and calculate spring potential energy. Newton’s second law for net forces is used to analyze a free-body diagram for objects undergoing acceleration. Students investigate centripetal force and apply it to a roller coaster. They pull a mass up different routes to a fixed height and develop a definition of work and its relationship to power. Students develop concept maps on force and energy and explore examples of each on a roller coaster. Chapter Challenge: Students design a sound and light show. Students connect vibrations and waves to sound. They observe transverse and longitudinal waves and investigate the relationship between speed and amplitude, medium on wave speed, the principle of superposition, and the relationship between speed and frequency, in order to construct instruments for their sound show. To design their light show, students explore reflected light, plane and curved mirrors, refraction of light, the effect of lenses, and color. Chapter Challenge: Students design an appliance package for a family home that is powered by a wind-driven generator. Students explore current, voltage, and resistance in parallel and series circuits. They create a simple fuse and calculate load limits of a household circuit. Students investigate heat transfer and learn about the laws of thermodynamics and entropy. They calculate the efficiency of various water heaters and apply this to designing their appliance package. Chapter Challenge: Students develop a toy that uses a motor or generator, and an instruction manual for assembly. Students explore the relationship between electricity and magnetism. They test the strength of different electromagnets and construct and operate a DC motor. They construct a galvanometer and use a permanent magnet and a solenoid to induce a current. They explore producing an electric generator and learn the difference between AC and DC. Maxwell and his discovery that all electromagnetic waves travel at the speed of light is discussed. Chapter Challenge: Students develop a museum exhibit to acquaint visitors with aspects of the atom. Students learn about the quantization of a charge, investigate spectral lines, and learn about Bohr’s model. The wave and particle nature of light is explored, Schrodinger wave equation is introduced non-mathematically, and the dual wave and particle nature of electrons is also discussed. Students learn about the strong force and Feynman diagrams. They explore radioactive decay and half-life using randomly tossed marked cubes. They are introduced to Einstein’s equation and use it to calculate energy liberated by the conversion of mass. Students also explore nuclear fission and fusion reactions. Chapter Challenge: Students develop a proposal for NASA by adapting or inventing a sport that can be played on the Moon. Students explore acceleration due to gravity, Newton’s second law, projectile motion, conservation of energy, friction, the period of a pendulum, air resistance and terminal velocity, and apply these concepts to develop their sport to be played on the Moon. Dr. Arthur Eisenkraft has taught high school physics for over 28 years. He is currently the Distinguished Professor of Science Education at the University of Massachusetts, Boston, where he is also a Professor of Physics and the Director of the Center of Science and Math In Context (COSMIC). Dr. Eisenkraft is the author of numerous science and educational publications and holds a patent for a Laser Vision Testing System, which tests visual acuity for spatial frequency. In 1999, Dr. Eisenkraft was elected to a three-year cycle as the President-Elect, President, and Retiring President of the NSTA, the world’s largest organization of science teachers. He has served on numerous committees of the National Academy of Sciences, including the content committee that has helped author the National Science Education Standards, and in 2003 he was elected a fellow of the American Association for the Advancement of Science (AAAS). Dr. Eisenkraft has been involved with a number of projects and chaired many notable competitions, including the Toshiba/NSTA ExploraVisions Awards (1991 to present), which he co-created; the Toyota TAPESTRY Grants (1990 to 2005); and the Duracell/NSTA Scholarship Competition (1984 to 2000). In 1993, he served as Executive Director for the XXIV International Physics Olympiad after being Academic Director for the United States Team for six years. Dr. Eisenkraft is a frequent presenter and keynote speaker at national conventions. He has published over 100 articles and presented over 200 papers and workshops. Quantoons, written with L. Kirkpatrick and featuring illustrations by Tomas Bunk, led to an art exhibition at the New York Hall of Science. Dr. Eisenkraft has been featured in articles in The New York Times, Education Week, Physics Today, Scientific American, The American Journal of Physics, and The Physics Teacher. He has testified before the United States Congress, appeared on NBC’s The Today Show, National Public Radio, and many other radio and television broadcasts, including serving as the science consultant to ESPN’s Sports Figures.